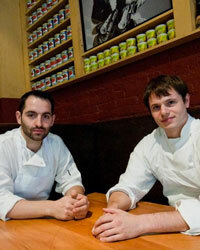 Won Best New Chef at: Torrisi Italian Specialties, New York City. Born: (MC) 1980; Queens, NY. (RT) 1979; Summit, NJ. Education: (MC) The Culinary Institute of America; Hyde Park, NY. (RT) The Culinary Institute of America; Hyde Park, NY. Experience: (MC) Babbo, Lupa, Café Boulud, WD-50 and Del Posto, New York City; Ristorante La Dogana, Tuscany, Italy. (RT) Aquavit, Café Boulud and A Voce, New York City.